*Date of Birth - 20th December 1953. 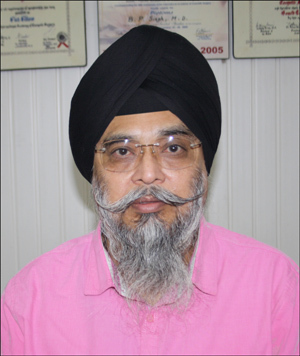 Leading Cosmetic and Plastic Surgeon who Introduced & popularized the concept of plastic and cosmetic surgery in northern India for the first time in 1988. Visited 18 different Countries so far. Liposuction - Developed and modified several original techniques- Repeated Liposuctions at Shorter Intervals. Tummy Tuck- Abdominoplasty with/without liposuction, Repair Divarication Rectii, Neo umbilicus formation. Obesity Management - Diagnosis and treatment plan. Lipo Injection - Developed original technique -Singh's Lipoinjection Technique. Rhinoplasty - Augmentation, Reduction , Hump reduction, Nose jobs of all varieties. Cosmetic Surgery of External Genitalias - Size and Shape correction, Vaginoplasty, Hymen Formation. Gender Reassignment Surgery - Transsexual's, Male to female, female to male. Cosmetic Skin Care - Glycolic Acid peel, Non Surgical Rejuvenation. Treatment of Congenital / Post traumatic / Post Burns / Post operative Defects and Deformities. Accidental injuries and Burn injuries managements. Cleft Lip-Palate Surgery and Surgery for other inborn deformities- syndactyl, polydactyl, hypospadius. Causality - Emergency general surgery. - Surgery of Kidneys and urinary tract. - Surgery of Genital regions. - Surgery of Breast / Thyroid / Face etc. b. 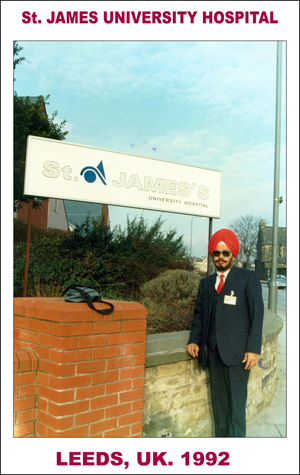 Running own private hospital since 1988 under the name and style : "CENTRE FOR LASER COSMETIC SURGERY; " at 261, Mota Singh Nagar, Jalandhar 144001 Punjab INDIA; till date. Dr. ILLIOUZ (France) -With Prof. Illiouz on Liposuction (Illiouz started Liposuction in 1977 for the first time, Presented, Published & Popularize the technique of Liposuction. He has added modifications in his original technique to make it more safe popular). 1982 Post Graduation-M.S., (General Surgery), M.L.B. Medical College, Jhansi, India Medical Registration : No 33866, dated 25 Nov 2003 ; PUNJAB MEDICAL COUNCIL, Mohali Punjab . 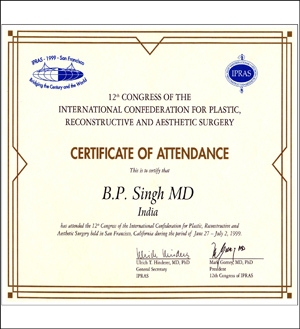 Attended almost all conference & workshops on Plastic & Cosmetic Surgery held in India. 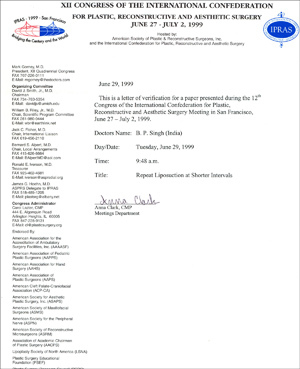 Attended on invitation XII Congress of the International Confederation for Plastic, Reconstructive and Aesthetic surgery June 27 - July 2, 1999, San Francisco, California, USA. Presented two original papers - Title: (039): Repeated Liposuction with Lesser Time Gap. 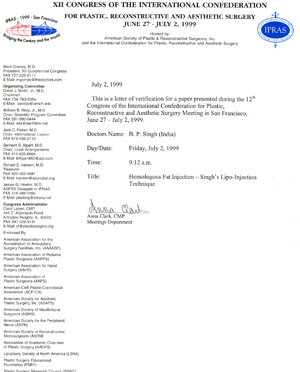 Title: (069): Homologous Fat Injection - Singh's Lipo-Injection Technique. 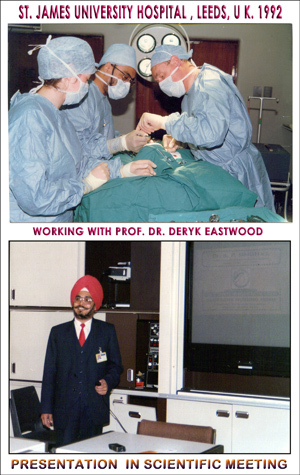 Attended on invitation World Congress on Aesthetic And Restorative Surgery, Feb 10 -12, 2001, Mumbai, INDIA. Presented Singh's Lipoinjection Technique. Conferred two awards :- BEST SCIENTIFIC PRESENTATION AWARD 2001. 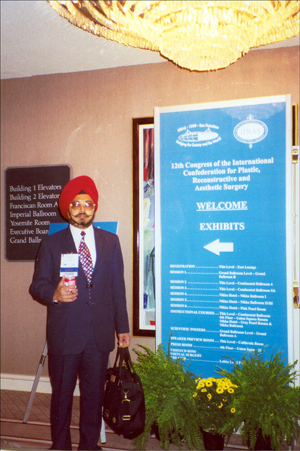 Attended on invitation as only INDIAN, 2nd World Congress On Cosmetic Surgery, 25-29 Oct 2001, Sydney Australia and presented Singh's Lipoinjection Technique. Conferred 'Rashtriya Chikitsak Ratan Award'[GEM of Physicians of INDIA] by Nations Economic Development and Growth Society, New Delhi on 29th April 2002. 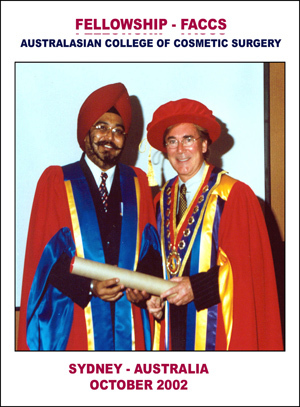 Conferred " Fellow of International Academy of Cosmetic Surgery" at Varna, Bulgaria, June 2003"
Conferred " Fellow of The Australasian College of Cosmetic Surgery" on 19th Oct 2002. at Convocation held in Sydney Australia. 2 - Research oriented work/ projects. 3 - Presentations and publications at International platforms. 4 - Academic & Literary work in medical field including teaching. 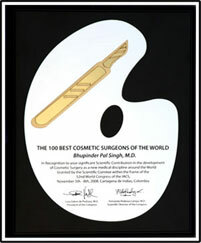 Write-ups [ Articles and Interviews - more than 100 insertions ] to popularize the concept of Cosmetic surgery and Plastic Surgery published in UK ( PUNJAB TIMES, PARDESEN, PUNJABI POST, MANJIT) and various leading regional and local news papers - namely - Indian Express, Tribune (English, Hindi, Punjabi). Financial Express, Punjab Kesri, (Hindi) , Jagbani (Punjabi), Urdu-hind samachar. Ajit Daily -Punjabi & Hindi . Interviews & articles published in various family magazines and health magazines of English, Hindi or Punjabi of national and regional circulations. Several TV interviews on various topics related to plastic & cosmetic surgery (this has helped average men to know that plastic surgery & cosmetic surgery is a necessity - not luxury.). Several guest lectures at various schools, colleges, club meetings to develop the awareness in society at large. i. Prizewinner of ALL INDIA ESSAY COMPETITION IN 1977.
from time to time- New Delhi. Agra, Lucknow, Kanpur and Ernakulam (Kerala). iv. Published article in Indian Journal of Medical Education -Students point or view. v. Accepted research paper for presentation at Asia pacific conference, Colombo, Sri Lanka. 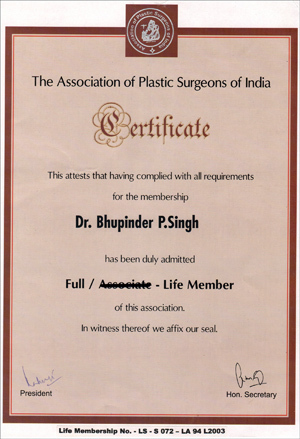 Life Member Association of Plastic Surgeons of India. Life Member Association of Surgeons of India. Organized state conference -Pimacon 93-at Moga as organizing secretary. 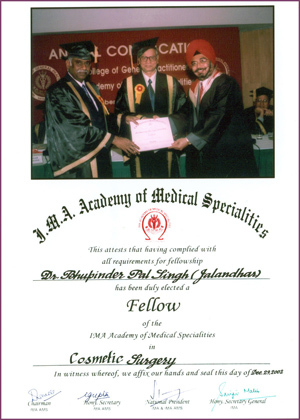 Organized Punjab State Level " CME 2003 " of IMA ACADEMY of MEDICAL SPECIALITIES on 21st Dec 2003, JALANDHAR, Punjab. INDIA. Various service projects/helps to needy & downtrodden, under privileged under the banner of LIONS INTERNATIONAL or ROTARY INTERNATIONAL. Worked at Lion's Club at district level. PRESENTLY - PAST PRESIDENT - Rotary Club, Jalandhar West, drafted Club Constitution for the first time. Serving Rotary Distt 3070. 1. 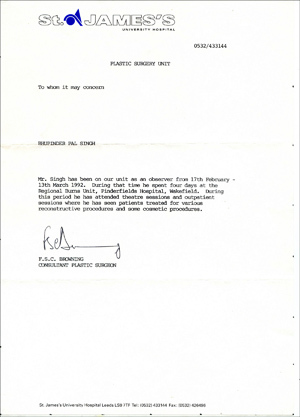 Research paper-Stationery White patch accepted at International Conference at KUWAIT 1996. 2. 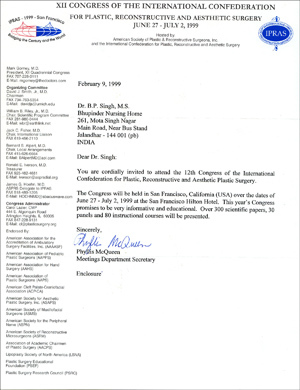 Research papers in the field of aesthetic surgery presented at XII CONGRESS OF THE INTERNATIONAL CONFEDERATION FOR PLASTIC, RECONSTRUCTIVE AND AESTHETIC SURGERY June 27 - July 2, 1999, San Francisco, USA. Title: (039): Repeated Liposuction with Lesser Time Gap. 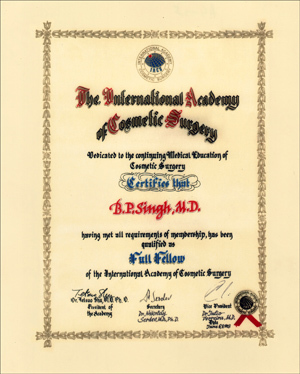 Title: (069): Homologous Fat Injection - Singh's Lipo-Injection Technique. BEST SCIENTIFIC PRESENTATION AWARD 2001. & WORLD LEADER OF COSMETIC SURGERY. 6. Attended and participate in International Conference of International Academy of Cosmetic Surgery at Varna, Bulgaria June 2003. presented two Papers. 7. 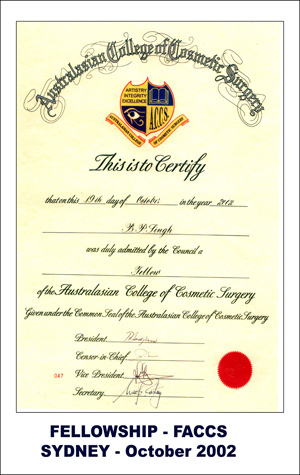 Appeared and cleared examination conducted by INTERNATIONAL BOARD OF COSMETIC SURGERY to become "BOARD CERTIFIED COSMETIC SURGEON"
8. Attended and participated in XIII CONGRESS OF THE INTERNATIONAL CONFEDERATION FOR PLASTIC, RECONSTRUCTIVE AND AESTHETIC SURGERY, Sydney. August 2003, presented two papers. 9. 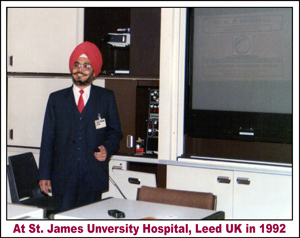 Attended and presented three lectures in World Congress on Cosmetic Surgery, 26-29 Dec 2003, Mumbai INDIA; Topics " Aesthetic Breast Balancing", "Lipografting", & "Future of Cosmetic Surgery"
10. Attended on invitation as Faculty member 49th Meeting and World Congress of International Academy of Cosmetic Surgery, Sept 17-18 2004, Lisbon Portugal. Discussed two topics. 11.Attended on Invitation as Faculty member OBESITY2005 held in Mumbai on 4-6 March 2005, discussed topic " Adiposity and Cosmetic Surgeon." 13. Participated in India Medical Tourism Conference and Expo 2005 . June 2-4 2005 Alexandra Palace, Wood Green London UK. 14. Attended on invitation as International Faculty member 12h Brazilian Congress on Aesthetic Medicine, held in June 15h to 18h 2005, in the city of Salvador, Bahia, Brazil. Two presentations of 20 min each on Adiposity and Rejuvenation done. 16. Participated in India Medical Tourism Conference and Expo 2006 . June 2-4 2006 Olympia 2, London UK. 17. Delivered two lecture on “New Tuck and Lift operation with Diamond and Triangles Technique” and “Simple and Easy Technique of Suspension Breast” in the 52nd World Congress of the International Academy of Cosmetic Surgery [IACS] held at Hilton Hotel, Cartagena COLOMBIA South America 5-8 November 2008. 18. 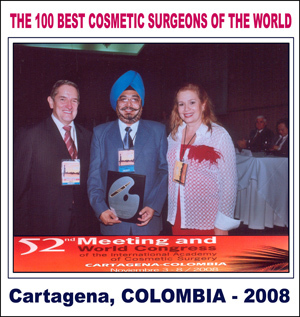 Conferred the 100 BEST COSMETIC SURGEONS OF THE WORLD during 52nd World Congress of IACS, at Cartagena, November 5-8 2008, Colombia. 19. 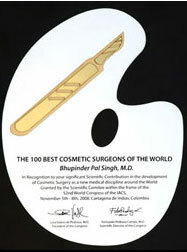 To present original Technique on 30th Nov 2009 at Ashoka Hotel New Delhi during IPRAS 2009 [ International Confederation of Plastic Reconstructive and Aesthetic Surgery ] title : Brachioplasty and Inner Thighplasty with Singh’s Triangles and Diamond Technique. 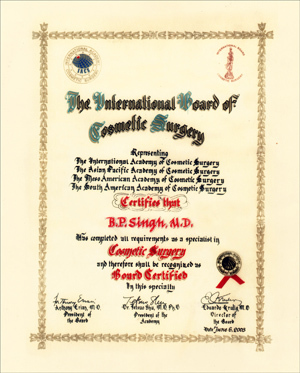 Publications: Singh' Lipoinjection Technique" published in 'International Journal of Cosmetic Surgery and Aesthetic Dermatology', Vol 4 No 3, 2002.